Entry level PCPs have reached new levels of quality and features that just a few years ago would have been unthinkable. The Gamo Urban and the Umarex Gauntlet embody the best of this trend. These guns have a lot of similarities and some big differences so let’s put them in the ring and see which one comes out on top. In the red corner is the Gamo Urban. Made by the venerable Spanish airgun maker, Gamo, in a certain factory in Birmingham, England, the Urban features a cold hammer-forged barrel, lightweight, and compact size. The Urban is a smaller synthetic version of the very successful Gamo Coyote, and as such has a reputation to live up to. It comes in any caliber you like as long as you only like .22 caliber. In the blue corner, from the German giant, Umarex, is the Gauntlet, their first PCP, boasting a floating barrel, a regulated bottle, and plenty of adjustability. It is available in .177 and .22, with a .25 somewhere in the future. Based on the popular QB platform, the Gauntlet has all the features airgunners have been asking for. Does it live up to the hype? Let’s find out. The Gamo Urban is at the top of its form and weighs in at only 6.7 lbs and measures a compact 42″. Pictures don’t do this gun justice. As soon as you pick it up you will recognize its quality and appreciate its ergonomics. The synthetic stock feels solid, the gun shoulders really well, and it feels great in the hand. A textured stock and stippling on the sides of the forestock and grip mean it won’t slip on you even when wet. The length of pull is just right for me at 14.5″, and the pistol grip is very comfortable, although it is a bit small for my large hands, at least while bench shooting. In the field it’s fine. The Umarex Gauntlet hasn’t missed its feed lately and it weighs in at 8.5 lbs and measures 46.75″. The weight, though, is well distributed and the gun doesn’t feel heavy or unwieldy to me. The matte-black synthetic stock has very mild texturing on the bottom of the forestock and the grip, but it’s too mild to provide much grip when wet. There is a nice curve in front of the trigger guard where the gun balances and my off-hand naturally settles into it. The length of pull is a little short at 13.75″ but not uncomfortably so. The long, floating barrel on the Gauntlet may be good for accuracy (that will come up in a later round) but it is something that needs to be handled properly. A hearty bump may shift your poi, so treat it with a bit of care. The shroud over the tank is a bit bulky and may be off-putting to some, but I don’t mind it. The tank shroud has been a bit problematic according to some reports, and, in fact, the one on my gun doesn’t settle quite into place without a bit of fiddling. The adjustable comb will feature in a following round, but let me just say here that it is a really nice feature, especially at this price and it adds a lot to the ergonomics of the gun. Both the Urban and the Gauntlet are fed by a bolt action, and on both it is fairly stiff. This doesn’t seem to be a common problem, but my Urban would occasionally catch as I pulled the bolt back and if I wasn’t careful I would double load a pellet. After greasing up the action a little it happens less often. Verdict: While the build quality of the Gauntlet is good, it can’t compete with the smooth polish of the Gamo, and its greater size and weight leave it lagging behind. 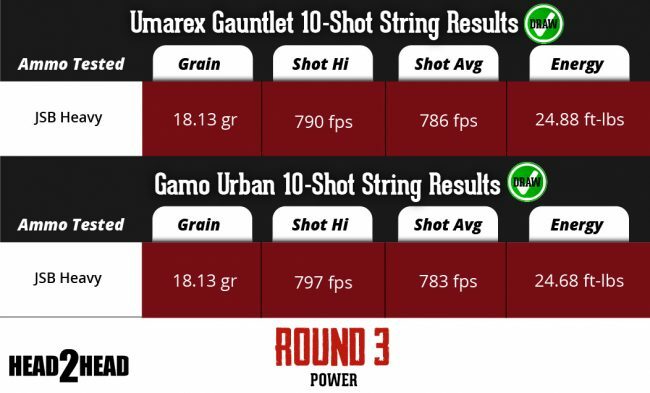 In spite of the issue with the action, the slim and tough Gamo Urban wins the first round! The Urban sports Gamo’s CAT or Custom Action Trigger. It adjusts for first and second stage travel, with the turn of a screw for each. The trigger lets off consistently at about 1lb 10oz., which is great, but it is not at all crisp and is a little hard to predict. There are aftermarket improvements, but out of the box, I felt it could be better, although it is not a bad trigger, especially at this price. The trigger of the Umarex Gauntlet is only a single stage trigger, and out of the box it was long and creepy. But it has three adjustment screws that adjust pre-travel, sear engagement, and over-travel. Although you need to take the action out of the stock to do it, the trigger is very easy to adjust, and after a few minutes, I had it where I wanted it. Now it has very little pre-travel and lets off crisply with only 1lb 2 oz of pressure, and is as good a single stage trigger as you could hope for. Verdict: The Urban has a good trigger, but even though it is only a single stage trigger, the trigger of the Gauntlet easily adjusts to become an extremely good triggerand is one of the best in this price range. The Gauntlet wins round 2! This round our competitors slugged it out without giving an inch! The Gamo Urban shot the JSB Heavy 18.13gr pellets at 783.1 fps, yielding a very respectable 24 foot-pounds of energy. The Umarex Gauntlet shot the same pellet at 786.5 fps, putting out 24.16 fpe. Verdict: While the Gauntlet I tested seems to be shooting a little hotter than most, the difference in fps between the Urban and the Gauntlet is negligible. Round 3 is a tie! The Gamo Urban has an adjustable trigger and that is about it! On the other hand, the Gauntlet has a fully adjustable trigger and an adjustable cheekpiece. And the cheekpiece is so easy to adjust. Just loosen the sling stud below it and turn the wheel to move the comb up or down. It is smooth, has crisp and audible clicks, and locks in place by just tightening the sling stud up again. You’d be hard pressed to find a smoother and more convenient adjustable comb on a gun of any price. If there is anything to criticize, it is that even at its highest adjustment, the comb still feels a bit too low for me. But that is the fault of my skinny face more than anything else. Most will be able to achieve a perfect cheekweld with this gun. It’s worth mentioning that while it isn’t adjustable, the comb of the Urban is about as high as the Gauntlet’s is at full extension, so those of you who like high combs won’t be missing out with the Urban. Verdict: The Urban has a lot of things going for it, but adjustability isn’t one of them. The Gauntlet wins round 4! The 105cc cylinder on the Gamo can’t be expected to yield a lot of shots and it doesn’t. However, for its size it does quite well, and the shots are very consistent, especially if you only fill it to 200 bar instead of the max 236 bar. Instead of 30-32 shots, this will give you 24-25 very consistent shots. They are so consistent, in fact, that the gun acts as if it were regulated. There is some very good valving inside of the Urban. The silver lining of the smaller cylinder is, of course, that if you are filling with a hand-pump, and since this is an entry-level PCP you may very well be doing that, you will appreciate the shorter pumping sessions to fill up your gun. It won’t be a burden to pump, especially if this is a gun for pesting and small game hunting. If you see more than 25 squirrels or rabbits in a day of hunting, you live in a better part of the country than I do. Of course, if you are at the range, you may get tired of filling up every two and half magazines. The 13ci reservoir on the Gauntlet is over twice the size of the reservoir on the Urban. The real kicker is that it is regulated, so the 60+ shots that you get are very consistent, although as I mentioned above, so are the Urban’s. But 60 shots is a lot! It gets more shots, in fact, than many PCPs costing much more. This is the first PCP to be regulated at this price and any other regulated gun is going to cost you at least double and more likely triple or more! This is an incredible feature. Verdict: With its regulated bottle yielding over 60 shots in .22 the Gauntlet wins round 5! This round was another close one! The Gamo Urban put ten shots in a hole measuring 0.6in center to center at 35 yards. The Umarex Gauntlet started really strong with 9 shots going into under a half inch but the tenth shot opened it up to also measure 0.6in center to center. I’ve shot ten-shot groups under an inch with both guns at 35 yards, but this was what they did this round. We’re going to revisit this the next time we go to our 100 yard range to see if it changes, but for now: round 6 a tie! The Urban has Gamo’s best sound suppression technology, the Whisper Maxxim Silencer. It is plastic and pretty girthy, but it does a pretty good job of reducing the report of the gun. However, it doesn’t make it really quiet. On our sound meter, it registers 93 db. For us, that is on the high end of backyard friendly, but your neighbors may vary. For the size of the thing we expected it to work a little better. The Umarex Gauntlet has a fully shrouded barrel, and the shroud also encloses a baffle unit which takes up the last few inches of the shroud. With all of this suppression, though, the Gauntlet isn’t any quieter than the Urban. This isn’t to say that the shroud and baffles don’t quiet the gun down, because if you remove them then it is very loud. On our sound meter it registers 91db. But frankly, we expected this gun to be quieter than it is. Verdict: While the Gauntlet and the Urban are almost identical on the sound meter, to my ears the Urban has a louder report. But they are so close that round 7 is a tie! The winner is: The Umarex Gauntlet! But before we see the bookie and go home, let’s recap the fight. Our competitors tied two rounds; the Gauntlet won four rounds; and the Urban won one. But I think that the fight was a lot closer than the numbers show, and for a lot of people the Gamo Urban may be the better choice. Why do I say that? Well, if you are a hunter, then I would wholeheartedly recommend the Urban. In the field, shot count doesn’t matter much, and its sturdy, compact build and light weight really give the Urban the advantage. And while the Umarex Gauntlet packs a lot of features into its price-point, some will appreciate the simple quality of the Gamo Urban. Aesthetically, the only thing I can criticize about the Gamo is the plastic silencer on the end. I’m glad it’s there but I wish it looked better. But overall, I think most will like the looks of the Urban over those of the Gauntlet. The one real drawback the Gauntlet has for me is that I feel like I have to baby the barrel. I worry that any bumps will knock thePOI (Point of Impact) off, and while I know it takes a fairly severe knock to affect it, the concern is always there. Both have excellent ten-shot rotary magazines. The Gamo Urban uses BSA’s flawless magazine. The Gauntlet magazine is also absolutely reliable, and I like the ease with which it loads. The pellets just fall in, and if you notice a bad skirt you can just tip the pellet right back out. Gauntlet magazines are very cheap. You can get three of them for the cost of one Urban magazine. The Gauntlet ships with a single shot tray. The Urban’s manual safety is conveniently located right in front of the trigger, and is easily flicked on and off, which is another feature of the gun that fits it for hunting. The Gauntlet’s manual safety is located on the trigger guard and is both stiffer and noisier than the Urban’s. The Gamo needs a fill probe, which in turn needs an adapter <insert link> unless you want to leave it on your hose permanently. The Gauntlet uses a Foster quick disconnect fitting, which is the best fill system known to humankind. The Gauntlet’s bottle is easily removed and replaced with a spare, and they aren’t very expensive. 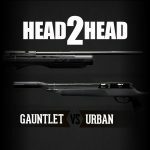 Airgun Depot has put together starter combos for both the Gauntlet and the Urban. Browse other Articles, Head to Head.